A Comic-Con center is starting to take shape in Balboa Park. In a Q-and-A, the organization's new director and a longtime Comic-Con staffer talk about what we can expect from the new home for popular arts. The San Diego Hall of Champions sports museum in Balboa Park is gone. In its place, Comic-Con International is building something new. The nonprofit plans to celebrate comics, movies, television and other popular arts year-round in its yet-to-be-named facility. There’ll be exhibitions, panels, film screenings and other events. The space will also serve to document Comic-Con’s own history and legacy. If done right, Comic-Con’s new project could reinvigorate the park. Just like its wildly popular annual convention, the space could attract hordes of new visitors, livening up what’s become the quietest corner of Balboa Park. In October, Comic-Con hired Adam Smith to lead the effort. Smith has worked at museums in the United Kingdom and the U.S. for more than 20 years. Most recently, he headed up an aviation museum in Texas. In a Q-and-A, I talked to Smith about his background, his vision and the shape Comic-Con’s new museum might take. 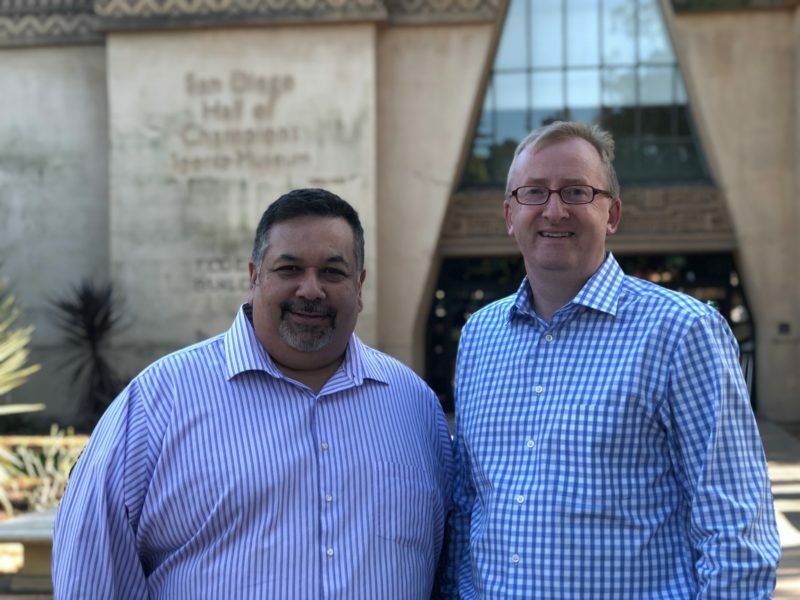 You can hear more of the interview in a new episode of Culturecast, Voice of San Diego’s podcast covering arts and culture in the region. So aviation to pop culture, what’s the first thing you tell people when they see a disconnect there? Smith: I think there is some value in being an outsider, because you can understand the perspective of someone who knows nothing. Now I actually know more about popular culture and comics than I did when I got in at the aviation museum. But to be truthful, I don’t want to position myself as being this huge knowledge base and curator of all the different subject areas in Comic-Con. What I hope to do are things that the fans absolutely love. And hopefully they will see new perspectives on the thing that they love. But also I want to do it in such a way that the ordinary person walking in off the street who knows nothing — they can see interest and fun and education in it, too. And I think that strikes to why Comic-Con is fundamentally doing this. Everybody knows the event has become just this mega thing. It’s become a little bit inaccessible … it’s so hard to get a ticket and so on. So being able to come to something 365 days a year that at least gives them a flavor of Comic-Con and helps them understand what’s going on inside that building — there’s a lot of curiosity about that. David, maybe you’re the right person to talk more specifically about the genesis and the impetus behind the museum. Comic-Con didn’t have to do this. Glanzer: With our growth over the years, it’s given us the ability to start looking at things that we’ve always wanted to do and are now able to turn an eye toward. And one really was the legacy of Comic-Con. But equally as important is the promotion of popular art. When Comic-Con first started, film, comic books and science fiction were considered fringe elements. Now some of the most popular books are science fiction or fantasy books that are being made into blockbuster movies and comics… So I think having an ability to have a place where Comic-Con could live 365 days was something we had longed for for a while. But equally as important to highlight various aspects of pop culture and popular art that I think, as Adam said, not only caters to fans but hopefully will intrigue people who don’t know they’re fans will come here and may discover that they actually have an affinity for something they may never thought of as being art. The museum world is a little highbrow and can be known as being kind of hoity-toity. You’re coming in with, like you said, lots of mediums that have long been thought of as maybe not museum quality. How are you going to deal with that sort of outlook? Smith: I have been in museums my whole life. I went to museum school, but I’ve always found myself as an outsider from that hoity-toity that you talked about. I think Comic-Con is a hugely fan-driven thing. It it it is whatever the antithesis of a finely curated fine art museum is. I think that that kind of idea runs through Comic-Con and it’s why, to be honest, spiritually, the last four months while I’ve been on this job it’s like you know I just feel like I’ve found my way home somehow. Glanzer: Our hope is that this museum, or center, or whatever it is that we end up calling it, is a place where people can cross-pollinate. You may come in for an interest in this, but may find something else that you’re interested in. Or you may come in just out of curiosity, but walk away with something that you really do find an interest in, and that’s kind of Comic-Con’s thing as well. Do you have specifics on shows and possible permanent exhibitions and that sort of thing? Smith: The traditional model of a museum — certainly that hoity-toity museum you talked about — is, we hire curators who build collections and decide what’s important and present that to the visiting public. I don’t object to that, but that’s not what we’re doing here. I think Comic-Con has been very fan-driven in terms of the content. Most of the content of Comic-Con comes from people from the community who want to come and present and show their world. And there’s almost a process of people voting by their feet — they go to what they’re interested in. I think we want to continue that way of thinking in the way we think about content for this place. So I’m seeing myself as much a facilitator of the voice and interests of the fan coming into this space as I am a curator in a traditional model. And I hope no curators listening to this who think I’m trying to take their jobs away because there is a place for it, but in the world of Comic-Con, truthfully, there are fans in our world who know more than any curator I could ever hire. We’re working on the design right now of how are we going to use this building. And a lot of the concepts are very much about flexible space that can be multi-purpose and work for a lot of different things that we could imagine today. But even now we don’t know how it’s going to play out. Things like virtual reality will be big and influential parts of popular culture. So we need something that is going to work not just in 2018 but also in 2038. But I think very broadly, imagine the same universe that Comic-Con addresses — the diversity of media and genres that Comic-Con addresses will be represented in here. There’ll be a special place in it for comics because that’s what Comic-Con came from and it is still the center of the creative universe. It’s immediately clear to me that part of the challenge is loads of content and how do we make it all work? So traveling exhibits and events and panels and screenings and things like that will all be part of what we do here. We’re just starting the process of actually inviting the outside world to throw their ideas in. I’ll be surveying people. I’ll even be having some sort of mass ideation sessions where we will invite people to come into the space and brainstorm on what will happen in this space. And we will be a true educational institution here. So the kinds of education programs that you see other museums putting on, inviting the schools here, using our subject matter to teach visual literacy, to teach creative skills, to teach technology skills. You know we’re absolutely going to embrace that really hard. And that I think is part of the fun of this project for Comic-Con is that we can explore a very positive direction. Are we putting a timeline on this? Do we have any definitive dates yet? Smith: I think it will open approximately 18 months after we’ve raised the money. So that immediately communicates to you that we’ve got some fundraising to do on this project. I would like by the middle of this year to have a good solid vision of what we want to do for a budget. Comic-Con is making a very significant investment in this project, but we will need to go and raise some money additionally. And so we need to put what I think will be a modest capital campaign together and execute that. And at some point, we’ll be confident enough in the resources to say, right, let’s start the process of construction. If I wanted an easy life right now, I could throw something together pretty quickly, stick a Comic-Con logo on the outside and a lot of people would come. It’s very clear to me that there’s a big pent-up demand in this community — there’s a lot of excitement about this, which is humbling and a little bit daunting for me because because expectations are very, very high. If I’ve got a problem, I think it’s that we’ve already got a building. Normally, when you’re starting a project like this, which is essentially a brand new visitor attraction from scratch, you’re looking at a piece of ground and you build the building and you house the exhibits in it. And everyone understands that it takes a bit of time to do all that. Because we’ve got the building sitting here, everyone’s like, all you need to do now is throw some things in it. But to do it to the quality level that I think everyone expects of Comic-Con and that does justice to the subject matter and the history and the culture of the organization, I do want to take the opportunity to do it to a really high standard. So speaking of funding, I think the perception is that Comic-Con is this giant corporation that makes tons of money and has hundreds of employees. You’ve already mentioned, it’s a nonprofit, it’s got a relatively small staff — much smaller than most people expect. One of the things that generated some buzz and concern was that Comic-Con has a dollar-a-year lease for the city-owned building in Balboa Park. It’s something that’s actually pretty standard in Balboa Park. Most of the organizations here are subsidized by the city to provide arts and culture to the community and to attract visitors. So talk to me about what sort of fundraising we’re talking about. Smith: We’ve got to go through the process of of deciding what it is that we want to do, budget that and that will create whatever the fundraising campaign is. But it will be millions of dollars for sure. This whole project strategically for Comic-Con as an organization is very interesting because Comic-Con, by the act of doing this, is becoming a year-round organization in a way that it’s just not been before. It’s existed year-round and has done events periodically year-round. But I think this changes the dynamics of Comic-Con in a really interesting way. It’s going to cause Comic-Con to behave more like the nonprofits that you’re very familiar with around town and the way that it communicates and acts and runs educational programming and also fundraisers. We want to build the museum as something that’s sustainable in its own right. And so, as we approach it, fundraising will be part of it — not just the capital campaign to create it, but also the programs that sustain us. Now, bear in mind that Comic-Con, we don’t necessarily need to look to the city of San Diego to shoulder all this burden. It’s very clear to me there’s lots of organizations in town and there’s lots of demands for fundraising dollars. One of the things that Comic-Con does bring is a national and international audience of people that really love this. So a lot of our fundraising activity will be talking to that group of people saying what we’re trying to create here is a year-round home for that thing that you really love and will you support this? In the museum world there is a movement to promote accessibility by offering free admission. Has that already been decided or are you still talking about that? Glanzer: Everything is open. I don’t know that anybody at this point can say exactly how that’s going to manifest, but I don’t think anything is closed. I think we’re open to a number of different possibilities. One challenge for the popular culture universe is diversity. Are people already reaching out saying, I really hope you think about an exhibit on women and people of color? Are you thinking about this already? Has this come up? Smith: It has come up. And first of all, I want to pay tribute to Comic-Con on the issue of diversity because I think the organization has been doing a tremendous amount in this area. I recently wrote what I believe to be the first-ever grant application that Comic-Con has ever written and it caused me to go and look closely at how Comic-Con as an organization has approached diversity. And I was actually blown away by how much is already being done by the organization. Comic-Con has a space problem. You’ve basically outgrown the Convention Center. There’s all sorts of politics swirling around why we can’t extend the Convention Center. I look at this space, 68,000 square feet. Are you going to be using this center at all to relieve some of those space issues? Glanzer: I think that’s something we would like to do. But again it’s going to the center or the museum is going to take the lead. But if we can, then we certainly will. There is a challenge with space in San Diego. There has been and we’ve known that for a while. We’ve been lucky in being able to expand out to some of the park spaces and to neighboring hotels and things of that nature. But it continues to be a challenge. We have this space here, we have a building that has some minor space in Barrio Logan, and at some point now that we have more bandwidth we may be able to start doing things at satellite locations. Smith: I was talking to someone recently who’s relatively well-known comic artist and he’s been coming to Comic-Con with his entire family for 35 years. And I was briefing him on this project and he stopped me and he said, what is Balboa Park? And it was clear to me that even though he’s been coming to San Diego and Comic-Con for 35 straight years, Balboa Park hadn’t even registered on his consciousness so that tells you something about how intensely people spend their time during the event and certainly my new colleagues here in the park tell me that during the week of Comic-Con they don’t really see a change. It’s just life goes on pretty much as normal. And I think when we get this place open that definitely will change. So a museum or a center or whatever you end up calling it is pretty permanent. Does this mean you’re married to San Diego forever? Are you guys staying here forever? Glanzer: We would love to stay in San Diego. And it’s interesting, I read once somebody had said why doesn’t Comic-Con just sign like a 50-year agreement with the Convention Center and be done with it. I think if we could guarantee that the hotel rates and everything else would be the same for 50 years then maybe that’s something we can entertain. But the truth of the matter is that doesn’t happen. Do we want to stay in San Diego? Absolutely. Do we think we can stay in San Diego? We’ve been able to stay here longer than I think some people thought we would be able to. But the truth of the matter is we signed three-year contracts for a reason and that is things change, hotels change. We are from San Diego, but we’ve operated shows in Anaheim, Los Angeles, San Jose, San Francisco and Oakland. We could operate Comic-Con in another city. We don’t want to. But again, it’s the end user. If it ends up being more difficult to our attendees whether it’s affordability or space or what have you, then we’re going to have to look at other options.